Personnel: Paul McCartney (vocals, bass guitar); Ringo Starr (vocals, drums); John Lennon (vocals); George Harrison (guitar). Audio Remasterers: Sean Magee; Steve Rooke; Guy Massey; Paul Hicks. Liner Note Authors: Derek Taylor; Alan Rouse; Kevin Howlett; Tony Barrow. Photographers: Robert Freeman; Robert Whitaker; Michael Cooper. 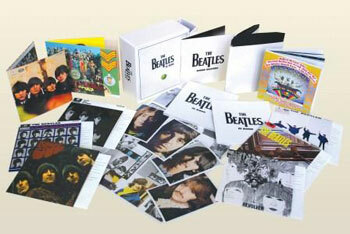 The STEREO BOX SET be the official canon, but what Beatlemaniacs have really craved is the MONO BOX SET. This limited-edition box is laden with new-to-CD mixes, including the genuine rarities of the previously unreleased mono mixes of the four new songs from Yellow Submarine, and its packaging is gorgeous, filled with mini-LP replicas with stiff cardboard sleeves of every album from Please Please Me to The Beatles, complete with replicated gatefolds and packaging inserts, all protected in resealable plastic sleeves. As pure physical product, this satisfies any collector itch, but this also is arguably the better-sounding of the two sets, providing ample evidence that the Beatles did spend more time on mono mixes during much of their career. For generations of listeners raised on stereo mixes, there are plenty of surprises here, from the faster versions of "She's Leaving Home" and "Don't Pass Me By" to the numerous little differences that pop up on SGT. PEPPER'S, THE WHITE ALBUM, and REVOLVER, all adding up to dramatically different experiences. Sometimes, the density of mono just has more force-- "Lady Madonna" rolls like a freight train, "I'm Down" hits to the gut--and sometimes the colors just seem more vibrant; in either case, there's enough emotional difference to make this worthwhile for the dedicated, and depending on taste, it may even be preferable. But there's no question of one thing: of the two sets, as a package, the mono box is a thing to behold. And there's also no question that those who waited 22 years to hear a better version of the Beatles will not be disappointed (although they may still wonder why it took so long for the Fabs to be treated as they deserve).